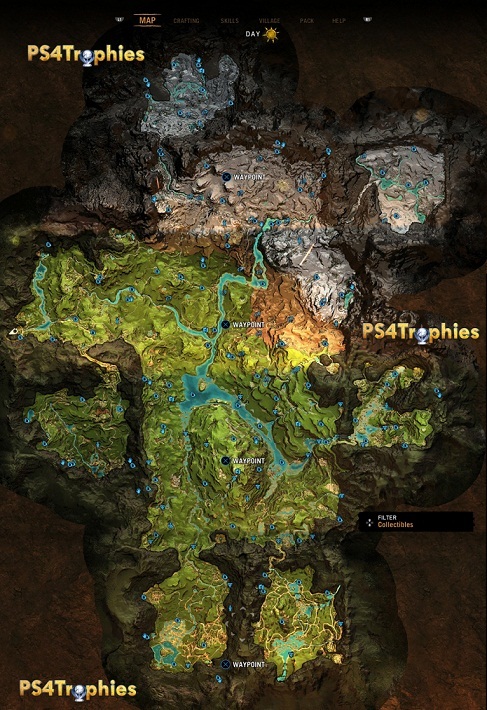 In the following guide we will show you a map to all 184 collectible items so that you can easily find the location of all Daysha Hands, Cave Paintings, Wenja Bracelets, Spirit Totems and Izila Masks. All Collectibles are displayed on your map and minimap, you have to be only in the vicinity of the collectible items once you uncover the area, the fog of war reveals. The following map shows you the location of all collectibles. By pressing X / A you can set waypoints and look for Collectibles targeted. But which collectible items there are and what benefits they bring? How many have you already collected, you can view the corresponding altar in the cave of your Wenja village. These bracelets can be found mostly in shrines. Behind destructible walls or raised platforms, when you reach close to Wenja wristbands you will also hear ghostly voices. Benefits: Many XP for each Wenja bracelet. You should collect the spirits Totems early and whenever possible because placing each Totem rewards you with a permanent XP boost by 2%. Benefits: 2% XP boost for each placed spirits Totem. You can find cave paintings, as the name implies, in caves. Take a torch with you to locate the corresponding painting in the dark caves. Benefits: Many XP for each cave paintings. To find the mask of the Izila Masks, you should go close to them and enable your hunter’s view, because they are then highlighted in yell. They can be located mostly on elevated position, so simply pull out your bow and shoot them. Benefits: Many XP for each downed Izila mask. The Daysha hands you see most often in Oros. You can find them in the form of stones, on which white handprints can be seen. At night you can track it even better, as they then begin to glow. Benefits: XP for each Daysha-hand plus bonus XP for certain milestones in the collection. For collecting 80 of 184 collectibles items in Far Cry Primal you get the Achievement or the Trophy Caves Hoarders.